Every so often I decide that I actually want to be a bit feminine for a change and you know wear make up and stuff. Funnily enough this has usually been around the time of BiCon which is the annual convention for bisexual people and allies to get together and hang out. This year however I have a party coming up and I’m thinking it would be nice to dress up for it for a change rather than just wearing my usual jeans and stuff. I think part of if is hanging around K and remembering when I used to dress up really gothy myself. I’m currently spending some time trying to find myself the right knee length skirt (yes I’m very fussy about what I wear being exactly right) and thinking about wearing it with some funky tights (I used to have a thing for funky tights). I think I may also be taking S to Camden market to buy a new pair of New Rocks. I used to have the ones I really like but sadly the zip went on them so they didn’t end up moving with me to London. I’ve also been practising a bit with eye make-up as I used to be good at it but am so hideously out of practice I’m having to relearn how to do it. So Me and S have been busy for the last few days creating a minecart railway network. We decided to create a minecart line going all the way down to the village on the south of the map with a spur line going to my pyramid in the swamps. It’s going well so far. S’s line is quite close to the village now after a day of creating bridge, tunnels and clearing obstacles. My next job will be to create a automated junction with buttons to select the appropriate destination. 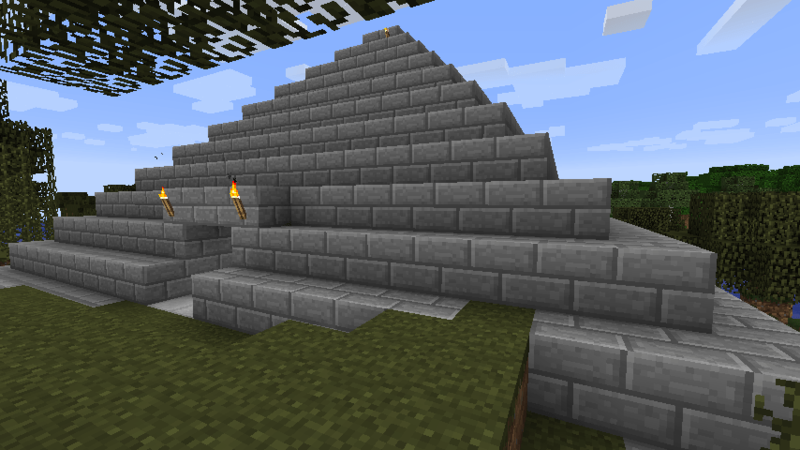 Then I will start laying track to the pyramid. I think it will take awhile as I don’t play as much and I also want to build a farm and a new house on an island I built a branch line to. Minediary: Starting to get a safe outpost. Well this is the first of my mine diary’s which is a sort of diary of my explorations off my world which has monsters. I have a small cobblestone hut with a mine underneath to provide shelter, resources and defence at night. I also now have a walled garden with some cattle, a sheep and a wheat field so food is no longer a problem. Now I have the basics sorted out I’m working on a new building using stone slabs so it looks nicer and lots more space to live in. I’ve also built a new defensive wall which should hopefully be spider proof. 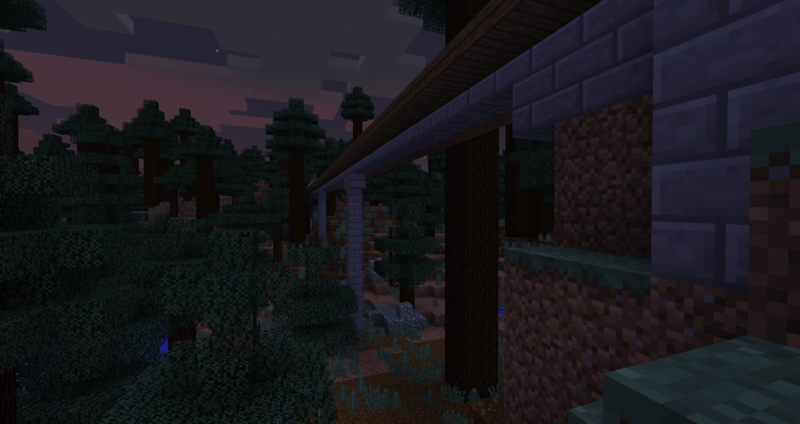 Meanwhile on the safelands (the main map which runs on peaceful mode) I’ve been helping S out by adding some points on the MTA (minecraft transit authority 🙂 ) line so there is now a junction to connect her line to the rest of the rail network. 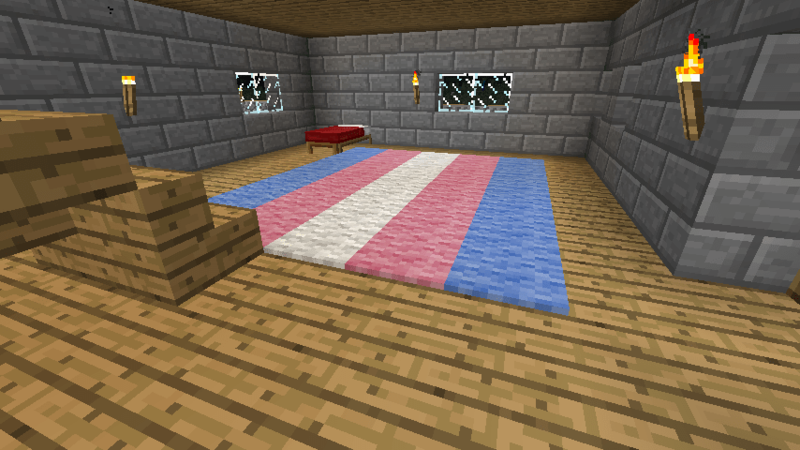 In addition to this I’ve been making a trans pride flag out of wool which is going along well despite nearly catching fire from a near by chunk of burning neverack! So the last 24hrs has been spent mostly recovering from disasters. The electricity was switched off recently at my flat which managed to take down my little arm server. For some reason it didn’t come back up when the power was restored so had to be manually rebooted last night. This turned out to be an exercise in futility as for some reason icedove (debian version of thunderbird) wasn’t showing any mail folders on my mail server. I ended up having to delete the server resync everything and recreate my mail filters which wasn’t fun. After this I’m kind of toying with the idea of building a backup power system for it. It should be relatively simple as I can just float charge a SLA battery and use switch mode regulators to provide 12V and 5V outputs for my NAS and home server. I can also use the unregulated 24V from the battery to supply power for my next version of my tube time displaying clock next to my bed. Of course this wasn’t the only fun to be had as I also had a flat tyre on the Brompton coming into Kings X. I ended up sitting on the floor by the doors on the train with a dismantled back wheel of a bike. The back wheel on my bike is especially bad as to remove it you have to take off the chain tensioner and disconnect the hub gear cable (which then needs to be readjusted or you can’t change gears properly). I did better though then last time I had to change the tire and my tirelever combined with spanner thingy saved the day again as I only needed one tool and it’s a metal tire lever so doesn’t snap (though it is coated in plastic). Well as people who know me know I’ve been playing a lot on my mine craft server lately. One of the things I added early on was a cron job to regenerate a Minecraft Overviewer map every night and this is finally at the state where I can share it. If you go to here you can see a map of my current Minecraft worlds on my server updated nightly. In the future I’m also going to update the server to allow downloading of the maps used on it by it’s players so they can keep them (atm only me and K). I’ve also been playing around with the multiverse plugins and created a new world with a harder difficulty so I can hunt mobs which don’t spawn naturally in peaceful mode as it turned out to be too difficult to fortify my existing buildings in my current world. I’ve created a little house at the spawn point so new visitors are reasonably protected from attack and begun exploring some of the caves underneath the house. This train calls at Reading, Lesbianism and Witchcraft! So today I’m back at work after a lovely weekend of me and S visiting K. It was nice to see K again as I hadn’t for awhile. We had lots of good food good company and watched lots of TV on K’s Netflix while doing it. It was the first time I’ve spent any time in Reading since I left in 2010 and felt a bit weird going back. It was also surprising how little has changed since I left the town in 2010 to move to London. Though the new train station has changed loads and is extra confusing for anyone who used to live there. Posted on 24th February 2014 Categories travels, Uncategorized1 Comment on This train calls at Reading, Lesbianism and Witchcraft! I’ve solved the getting the right seat height problem on my Brompton. Those who know me know that my preferred mode of transport is my trusty Brompton folding bike. One of the lingering problems I’ve found is that the folding process involves putting the seat right down. Since the seat post doesn’t have any way of marking it’s height this means that you can never get the seat to precisely the same height between rides. Today I found a solution to this problem. I think that if I attach a piece of string to either the bottom of the seat post or the underside of the saddle I can then put then attach the other end of the string to part of the frame when the seat is at the correct height. This will mean that the seat cannot go higher then the optimal height and I’ll have my favourite saddle height every time. I wonder why no one has ever thought of doing this before! Added: S said that string would probably stretch when it get wet which I replied you could always use something else such as plastic cord. Red sheep,blue sheep, purple sheep. Farming in minecraft. So this weekend I spent so time with S to chill out but also spent some time working on turning my house in minecraft into a farm. As you can see one of the weird things you can do is dye sheep different colours. Dyeing sheep also gives you the ability to breed two different coloured sheep together to create a sheep which is a mixture of the two colours. 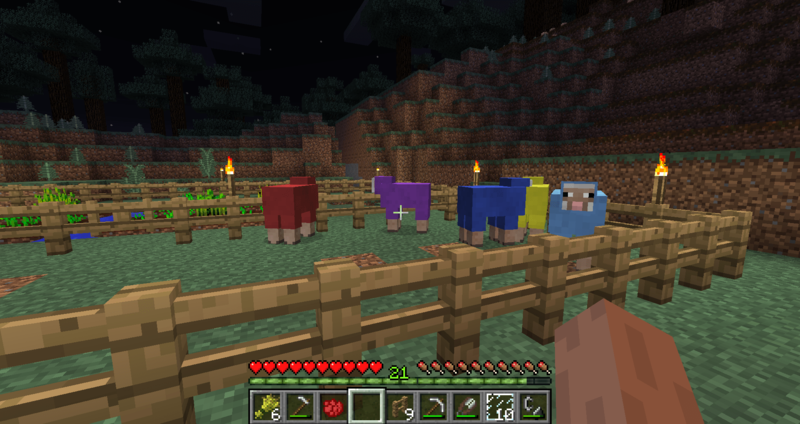 For example breeding a red sheep and a blue sheep creates a purple sheep. I’ve also been preparing to go from peaceful mode to easy mode. As I like the world being relatively peaceful one idea I’m thinking of is having a cron job which changes the difficulty dependant on what time of day/week it is. For example it could become progressively more difficult as I approach my bedtime :). I also did some other building over the weekend. I created a pyramid in the swampland far south of the forest area (I’ll update this post with a picture). The pyramid hosts a portal to the nether which I’ve created a walkway from to the portal in my house allowing easy travel between the two when it’s running in peaceful mode. I also have the railway line which goes from a junction just north of my house to a lake east of me. This isn’t the best picture of it but you can just about see it’s scale. I’ve done some more work on it since I took this picture and added lights and handrails.